Are you as excited to celebrate spring as I am? in the morning with our coffee and at lunch time for a quick salad. and says “hello! I’m here!” it makes me so happy. If you came here via Pam, Mary or Shirley, I hope you will enjoy your visit. 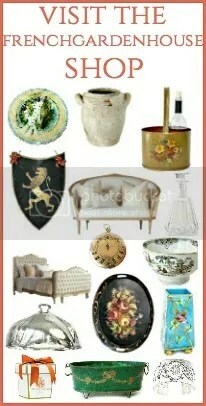 and gathered some of my favorite antique French pieces for the rest. What could be better for a spring or Easter table? The flowers are simply arranged in an antique French enamelware pitcher. tulips, freesia, wax flowers and statice. Keeping the flowers all to one color family always works. The tulips are such a beautiful color, aren’t they? And those freesia smell heavenly. is always a pretty idea. and seedlings add an amusing touch. This arrangement is one everyone can do. and let the tulips go where they wanted. flowers make everything more beautiful! Please visit my friends by clicking on their names below. It is always a treat to visit you in your beautiful French Spring garden. I am always in awe of the beautiful containers that you use for your floral creations and the exquisite antique accents on the table and in the garden. You truly have captured both the French and California vibe of Easter/Spring in the garden. I am enjoying your sunshine too…it’s been a bit dreary here to say the least. Now I so love the flowers, but must say I LOVE the pitcher! I spy a “coming attraction” …. Happy Monday Lidy…my favorite Mondays are sharing it with my wonderful Monday Morning Blooms friends! I throughly enjoy the Monday morning flower ladies and all of the ideas I gather from each. Your use of the the antique linen sheet for the tablecloth caught my eye. To be outside in the garden with the very best you have to offer is like saying thank you to “Our Maker” for bringing us us through a long Winter. Freesia Is among my favorite but here in Colorado it never smells as heavenly because of the lack of humidity her in Colorado. Thank you for sharing. Lidy, how I love the antique hand-painted French enamelware pitcher with your beautiful blooms! Your garden is so perfect for a small table full of lovelies. I can just imagine sitting in the warm sunshine, in your pretty garden, and sharing conversation with you, how wonderful that would be. It is a gorgeous day here after a stormy start to Palm Sunday. It is my pleasure to share Monday Morning Blooms with my friends. Wishing you blessings during this most Holy Week! You are so kind to say that Cindy. The flowers do all the work! It’s beautiful, Lidy! Wonderful colors and oh, how it feels like spring! Lidy, Charming post! I love your antique French hand painted enamel pitcher full of pretty spring flowers. I do think your analogous color scheme is quite pleasing. I love your flower choices also. Happy Easter, Lidy. He is Risen indeed! Lovely photo’s of all your flower’s so enjoy and I want to wish you and your family a very Happy Easter.